THE state's road maintenance backlog has hit a massive $2.2 billion with cash-strapped councils admitting defeat in stopping crumbling local streets and roads from damaging cars and becoming potential deathtraps. 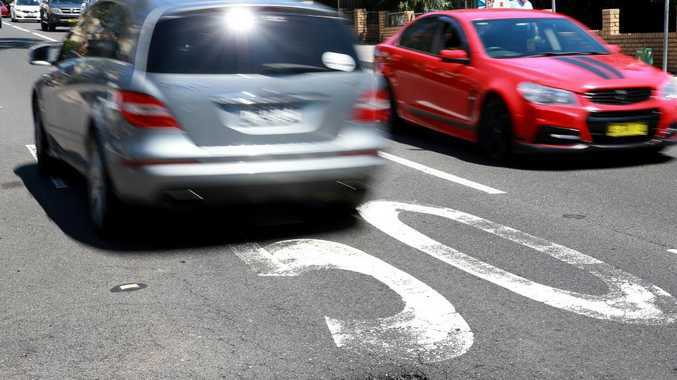 A new report from motoring body NRMA has revealed a 30 per cent jump in the backlog of pot-holed and deteriorating NSW roads requiring repairs since 2015. Councils are supposed to foot the bill for fixing local roads but are falling behind as they struggle with a "lack of general revenue", posing a threat to road safety, according to the report. The situation is so dire that experts claim an annual federal government injection of $180 million is required for the next five years to fill the blackhole. The biggest unpaid repair bill belongs to the Mid-Coast Council which has $115.5 million worth of jobs waiting on its books. NRMA spokesman Peter Khoury said a portion of federal fuel excise, levied at a rate of 41.2 cents per litre, should be diverted to raise the $900 million needed to fix the maintenance backlog. "These roads are simply not safe and if we don't fix the funding situation which has led to this blackhole then lives are at risk," he said. "The problem is worse in rural and regional roads because those councils do not have as much money and it is no shock the majority of deaths happen on these roads." The Local Government Association said councils, which are restricted by rate-capping, did not have enough money and called for help to help foot the bill. "Maintenance costs are dramatically increasing as our city gets more densely populated and our roads have to carry increasing heavy truck movements," a spokesman said. "We've long called for the NSW Government to establish a Fixing Metro Roads program to deal with this growing problem. "Unfortunately the last State Budget's funding ­allocations for local roads ­remained the same in real terms. 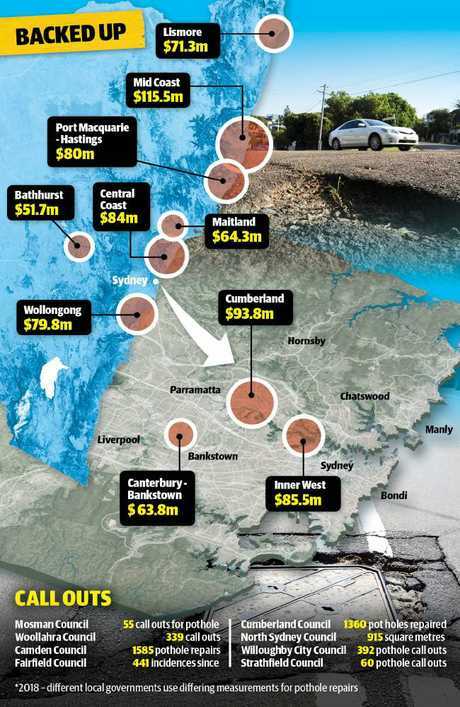 NSW won't be able to reduce its road maintenance backlog until the state and federal governments get real about funding." Councils in Sydney have failed to tackle the issue with their share of the backlog increasing 42.1 per cent to $572 million in the last year alone. Unfixed potholes after heavy rain pose a threat to motorists and big repair bills. 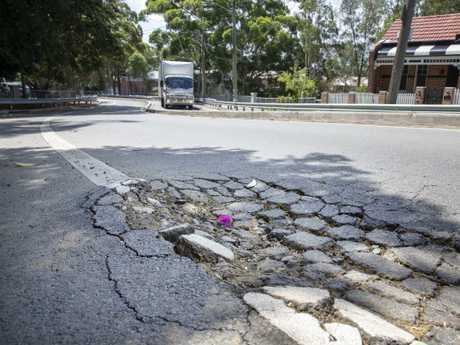 City of Sydney Council had 534 pothole jobs in 2018 with 170 occurring in December following the previous month's storm which dumped 100ml of rain on the city in just six hours. Camden Council carried out 1585 pothole repairs and Fairfield Council had 441 since April. Overall Cumberland Council has the biggest road repair backlog in the metropolitan area at $93.8 million followed by the Inner West Council ($88.5m), Canterbury Bankstown ($63.3m) Blacktown ($41.7m) and Wollongong ($41.3). 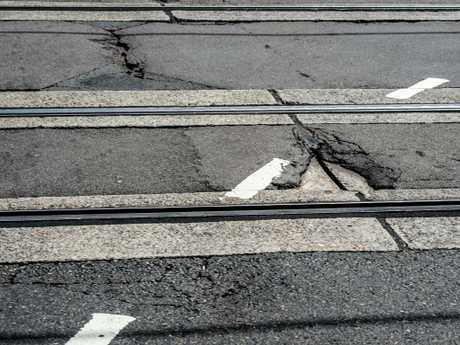 The report said damaged roads created serious congestion issues in Sydney: "Poorly maintained road infrastructure leads to congestion and bottlenecks on priority corridors, particularly in metropolitan areas." 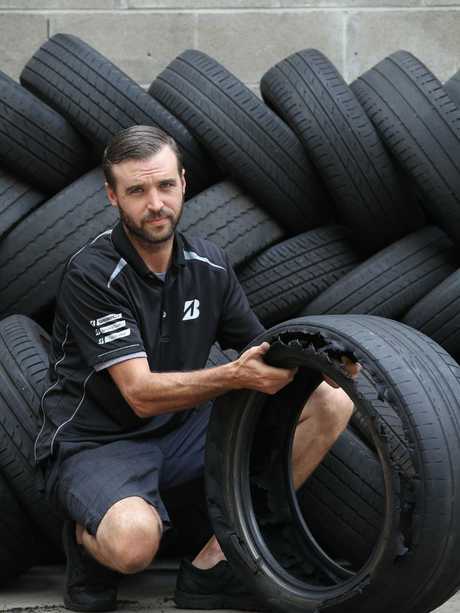 Daniel Hammond, who operates a tyre repair business, had a 30 per cent surge in customers after several storms in ­November. But he said the impact of a pothole could be even more serious. 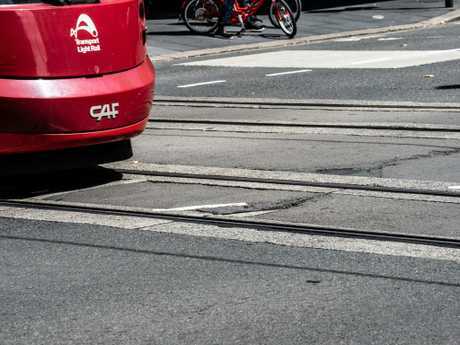 "The average person wouldn't know how to control a car that's had a blowout at 80km/h and that can have really catastrophic ­aftermath," he said. Dubbo mayor Ben Shields said lives were at risk ­because councils could not afford to fix damaged rural roads. "Roads are pretty much the most important things we have to take care of in rural areas otherwise families can die," he said. The NRMA report said increases in federal and state funds to local roads had not taken traffic growth into consideration. Roads Minister Melinda Pavey said there was "more to do" but government road maintenance funding had risen in recent years. "We understand the challenges that local government have across NSW which is why since we have been in government we have increased that funding for maintenance and helping them look after those roads by 50 per cent," she said. The NSW road network is around 184,859km in length. Roads and Maritime Services is responsible for the management of 18,028km of the major arterial road network known as state roads. RMS provides funding assistance to councils for managing their regional roads (18,257km) and some cash and other support for local roads. It also manages approximately 2970km of regional and local roads in the far west of the state where there is no council. Councils own and manage the land on all public roads apart from freeways. RMS is responsible for managing the full width of the road reserve on those state roads which are designated as freeways. Its responsibility for other state roads focuses on network development, building and maintaining roads. 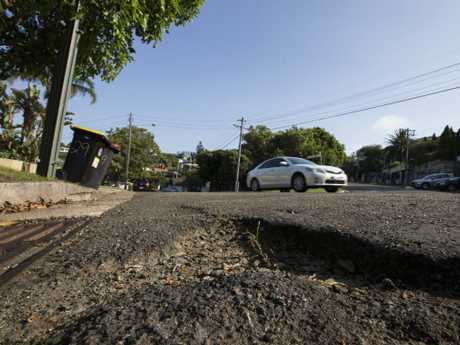 Potholes and other repairs needed around Sydney. The NRMA is asking us to dob in the worst roads in NSW. It has launched a Rate My Road survey to help understand problem areas, figure out what needs work and which roads are dangerous. More than 12,000 motorists had previously participated in the survey which helped achieve funding increases for the Pacific Hwy and the Princes Hwy. NRMA CEO Rohan Lund said there was a growing backlog in infrastructure funds. "We have seen the backlog grow to $2.2 billion, the scary thing is that's up 14 per cent in the last year," he said. "We have seen a lot of improvements at the state level, but for local governments, that's now a $1.7 billion gap."